Whether you are the active or passive person in your divorce makes a huge difference. By understanding these two perspectives I guarantee that your eyes will be opened. It is probably the most overlooked, although important, part of the divorce cycle. It is the cause of so much confusion, hurt and miscommunication. It is vital to find your position and understand how this view helps explain so much about how each one of us process the separation/divorce decision. To begin with, let me try to explain the difference between the Active and Passive Agent. The Active Agent is the one of the couple who first entertains the discussion of the issues at hand and could even suggest a separation as a solution to the issues discussed. The Passive Agent is the one who thought things were fine, maybe not perfect, but not even entertaining a separation in their future. I have included some questions below to help you clarify which agent you play in your own separation. 1. Who instigated the conversation or is pursuing a separation or divorce? 2. How did you respond and how did you approach the subject? Below is a time line. Use this to identify yourself and your spouse in these questions below. 1. Where do you find yourself on this time line? 2. Where do you see your partner on this same time line right now? 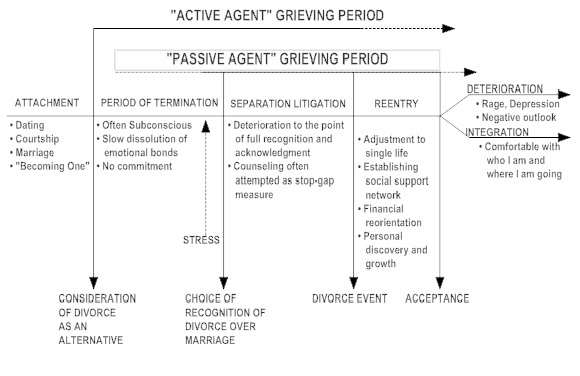 Note that the active agent (the one who instigates the divorce) begins the grieving process well before the passive agent. 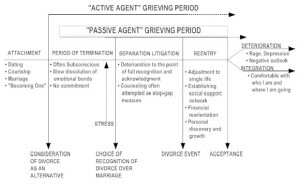 In some cases, the active agent goes through the entire grieving process and reaches a point of acceptance before going to the passive agent and announcing they feel the marriage is over. At that point, the passive agent just starts the grieving process. Often passive agents are confused and bothered by the attitudes of their partner. The passive one is in turmoil, while the active one seems carefree. The fact is, the active agent has probably gone through that turmoil already and has finally come to the point of acceptance and action. Now that you have discovered your position, lets look at why this makes such a difference in your thinking process. 1. Do you recall a time when he/she (active agent) may have started their time line? 2. Where were you emotionally at that point? Unaware? 3. When it was brought to the surface and you became aware, that is when you started your time line, where were they at that point in the time line? 4. As you are dealing with the shock and reality, where are they on the time line? 5. When the divorce happens, they are ready to move on into re-entry and you still have not reached the acceptance level yet. That is why they seem so unattached when you seem so fragile. Does this apply in your situation? 6. Do you see how this difference could make a big difference in how each of you are handling the divorce? Again, I stress that understanding this does not by any means lesson the pain. It is so hard to see the one you love appear cold or factual. When in truth, it’s not that they never loved you or don’t care, they simply had experienced what you are now feeling weeks, months and sometimes even years earlier, probably without you even realizing it. To gain this understanding will hopefully help you not take their actions or lack there of personally. They are just at a completely difference stage than you are. 1. 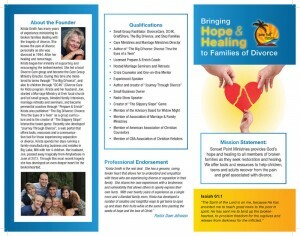 When did you start realizing that your marriage was in trouble and you began considering separation/divorce? 2. When you were at your highest stress that is probably the first time your partner even began to realize there was a serious problem and you had already decided it was over. When was that on the time line and can you remember the difference in your emotions? 3. It is important for you to realize that while you have accepted things and are moving on, your partner is still in the denial or depression state. What can you do to give him/her the help he/she needs to move on? 4. Try to be extra sensitive and patient when you enter the re-entry stage, because your partner is still processing the grieving stage. In what ways can you be more sensitive to their feelings and be more understanding? I cannot stress enough how important it is for you to be sensitive to where your partner is at emotionally. Look at this chart again and try to put yourself in their shoes. Be extra careful what you say and more importantly how you say it. This is a very painful process so the more thoughtful and patient you can be the less turmoil you will experience and most importantly the better this will be on your children. Understanding this difference could be the first time you feel you understand why your partner is acting the way they are. Use this as a tool to find some understanding during this very difficult time. The more you understand each other, the less chance you have of causing permanent damage to your relationship in the future. Search for peace. Open your heart for understanding. And allow the healing to start. I would love to hear your experiences that displays the difference between the Active and Passive Agents in your own personal experience. Please go to the Open Discussion Forum and share what you have experienced. I hope this tool was helpful and healing.